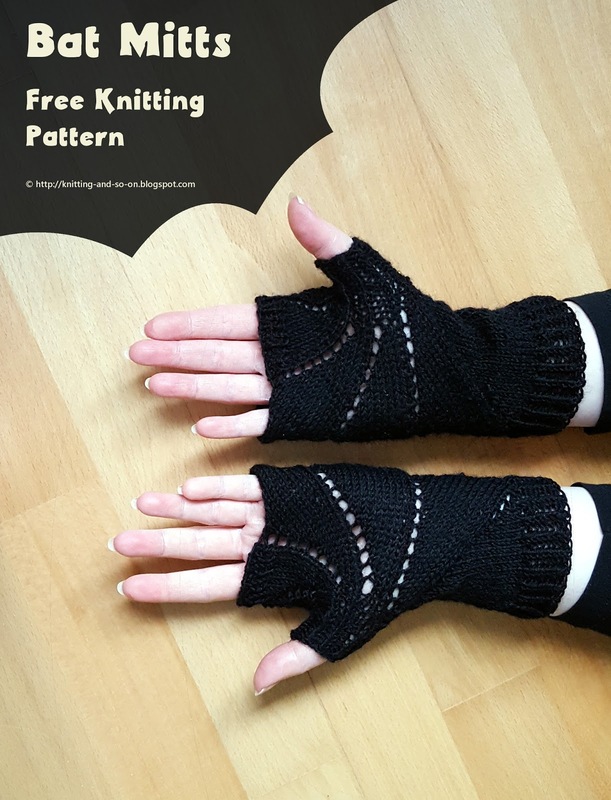 These were designed and knitted for a friend of my Mum's who had seen her black fingerless gloves and asked whether she could have a pair of black ones herself. In the end the lace pattern reminded me of the fingers of bat's wings - hence the name. Short Rows in the Round (and t+ky) I learned short rows in the round with this helpful video: http://www.youtube.com/watch?v=SCgycxLce94; however, I ended up doing the pick-ups differently. - "Wrapping" of the StitchesBasically, when you're on the RS, you do wrap the working yarn around the next stitch (from front to back) and then turn your work, i.e. the "normal" wrap and turn (w+t). When you are on the WS you slip the last stitch, turn your work with the yarn in front, wrap the yarn around the RIGHT needle and knit the slipped stitch. That creates a sort of double-stitch - one half of it has to be knitted together with the stitch in front when you're picking up the stitches. In the pattern, throughout the pattern I will call this stitch, t+ky (short for "turn and knit w/yarn-over"). - Picking-upWhen encountering a w+t, I turned the wrapped stitch on the needle, picked up the wrap from the front and knitted the stitch and the wrap together through the back of the loop. When reaching the stitch BEFORE the “double-stitch”, I turned this stitch and knitted it together with the yo through the back of the loop. 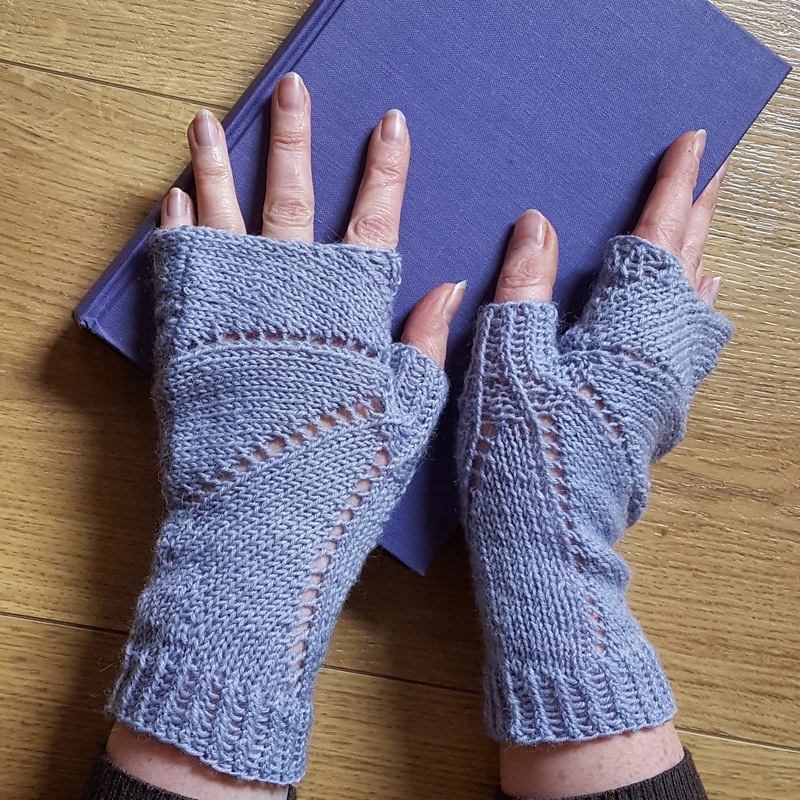 Picking up stitches from a gap or ditch: After the three needle bind-off there is one left over stitch which tends to have a distance to the stitches next to it. To avoid holes, I usually pick up one stitch from the gap and decrease over the new stitch in the following row (see also this YouTube video where it is shown on the example of a thumb gusset). In my experience (or the way I knit :) it's even better to pick up two stitches and knit decreases over them in the following two rows. In stockinette stitch 6 stitches gave 2cm in width and 7 rows gave 2cm in height. 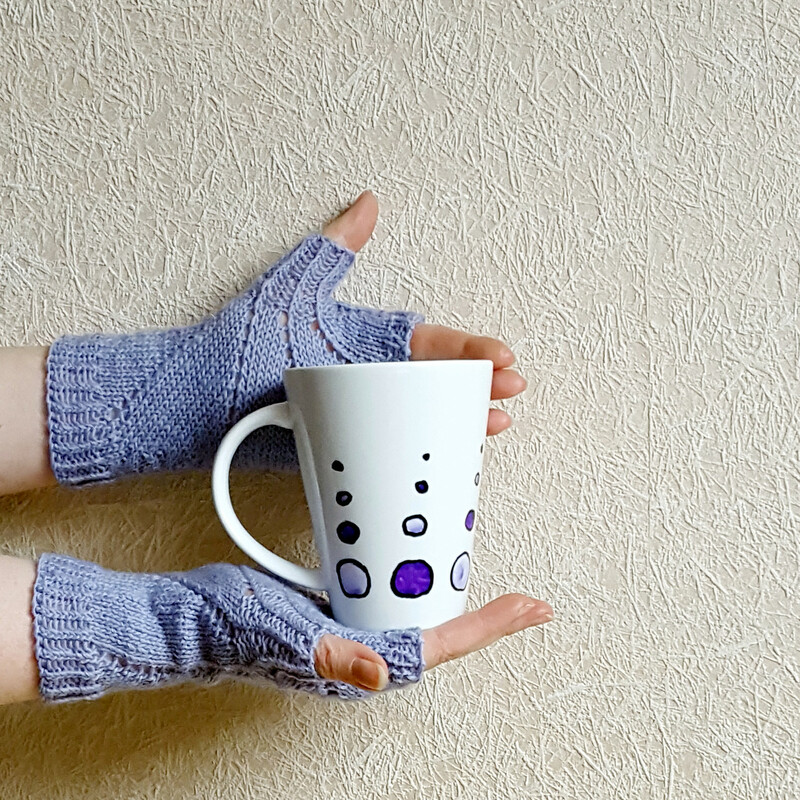 The finished mitts measures and 18cm in diameter a the widest point and about 18cm in length. These mitts are knitted in four parts. 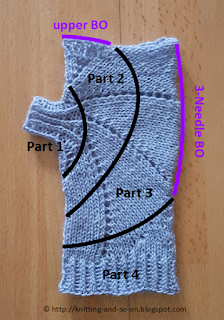 Part 1 - the thumb - is knitted in the round. 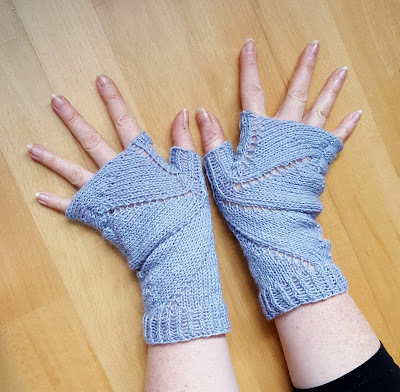 Part 2 - the first part of the palm - is also knitted in the round, at its end there is a small ribbing knitted on top to make sure that the upper BO doesn't curl in. 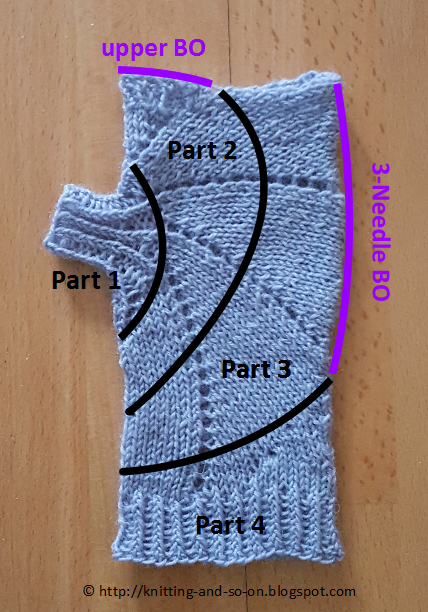 Part 3 is knitted flat and ends with a three-needle BO. 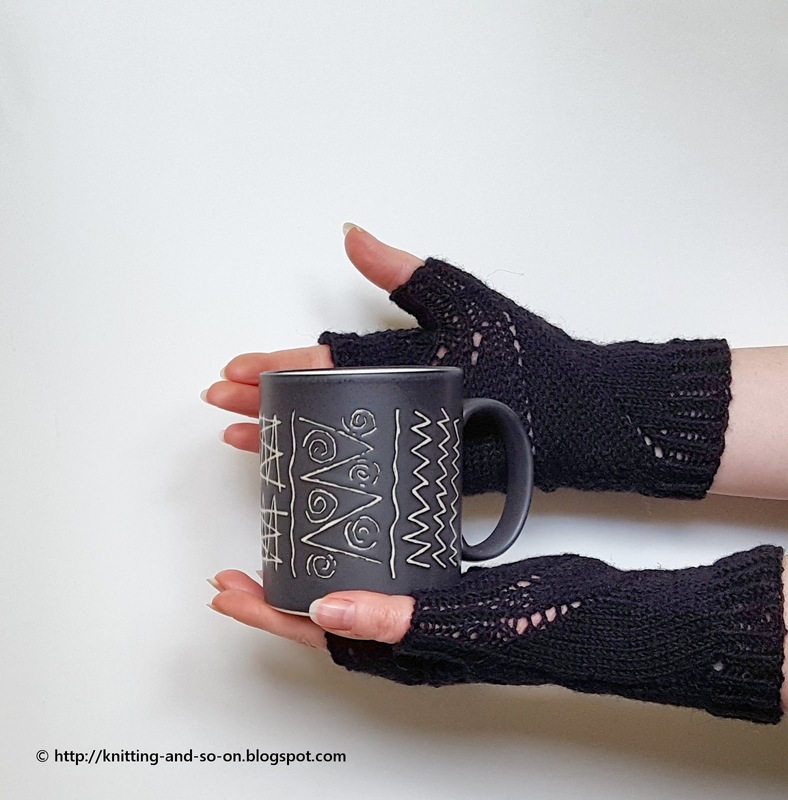 Part 4 - the cuff - starts with a few short rows to even out the height differences. 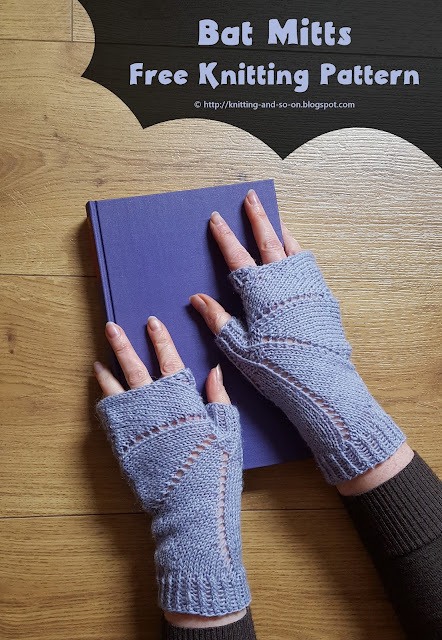 It is knitted in the round and ends with a few rounds of ribbing. 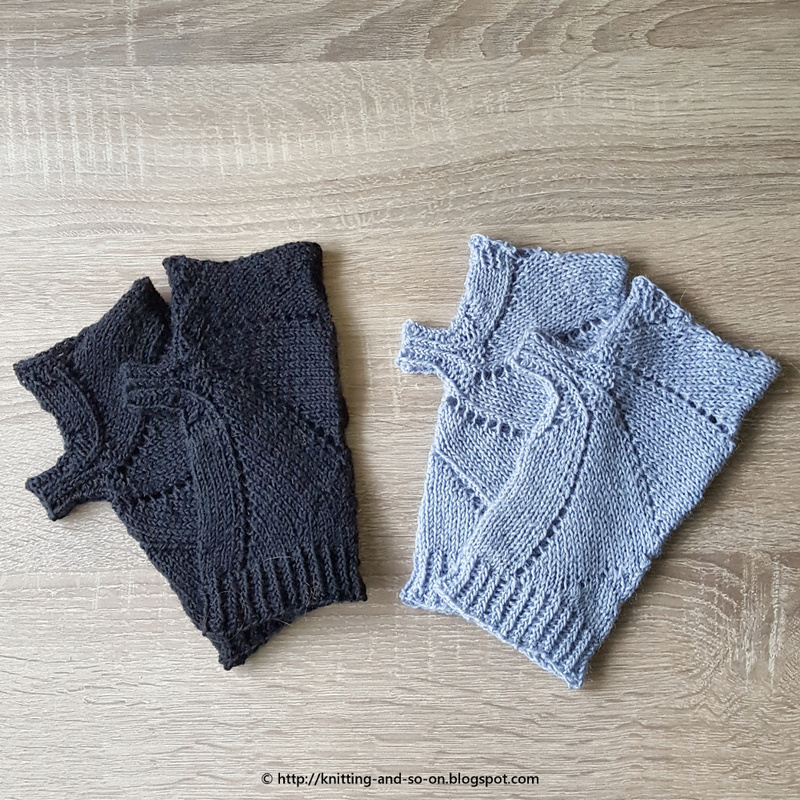 The second mitt will have different instructions to make it look mirror inverted to the first one. Round 19: BO14 sts in pattern (remove the stitch markers you encounter during the BO), k to marker, slip marker; and continue round like round 3 (i.e. * k1tbl, yo, k to m, sllip marker, repeat from * to end) - your piece should now look similar to photo 1 of the illustrations. Fold piece in half, right sides together. Your piece should now look as in photo 2. Do a three-needle BO of 31 stitches (remove the stitch markers you encounter during the BO), secure the last stitch and turn the piece back right sides out. Your piece should now look similar to photo 3. This blogpost was featured at Oombawka Design's Link and Share Wednesday Party 181 and at the Linky Ladies Party #93. Thank you! They are beautiful. Thanks for sharing your tutorial. Thank you very much. I'm glad you like them! What a beautiful and unusual design, I love how they really do look like bat wings. Thank you. And once again thanks for hosting your lovely link party! Absolutely gorgeous! I have to make a pair for my daughter. Her birthday is coming up and she always complain of cold hands!